"She usually loved the sun to reign, but today she enjoyed the surprise of rain." I spend a lot of time outside. I mean alot. Because I work at a computer most days, I try to get out everyday at lunch and on the weekends I walk for miles. Since I started spending more time outdoors, I realized that my wardrobe needed some shifting. The biggest change? Footwear. Not only do I have to be prepared for dirt, but we get so much rain because we are near the coast. For Christmas, I received a pair of red rain boots and a big golf size red umbrella. As I continue to edit my closet, I realized how much I really love the color red. My favorite color is blush, but a pop of red is classic and bold. 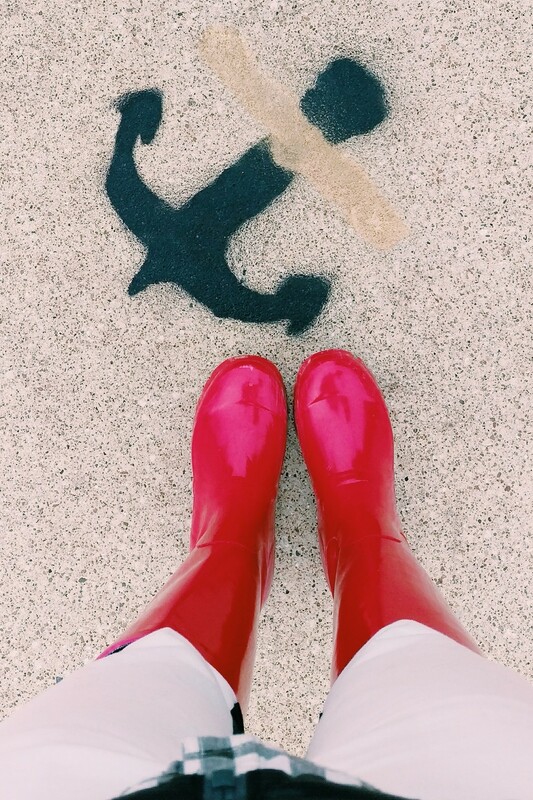 I thought it would be fun to share two outfits today with my new red rain boots. I also wanted to share how a classic pea coat works with two looks. Both outfits share gingham, but I used the print in different ways. First, with a scarf over a simple navy blouse and leggings. The second look sports a gingham button up underneath a puffy vest. I've talked about dressing in 3 colors a few times in the past. Both looks I really tried to edit down to just three hues. That way, I can play with textures and prints without the outfits looking overly busy. Another thing I really like about dressing in three's, is that packing for a quick weekend trip is a breeze. I've found that shoes can take up a lot of space. I could throw a simple pair of ballet flats in or a pair of heels and take both outfits from outdoor to an evening outfit by removing the puffy vest and adding a clutch. I spent New Year's weekend going on several long walks with my dog. It's nice to get out in the fresh cool crisp air during Winter. Usually this area is humid all summer, so I welcome the winter weather and relish getting to bundle up. Our winters are really short and it's nice to actually feel like it's January. I curated a bunch of options below for you to browse if you are interested in finding options similar to what's shown here. All are weather durable and comfortable - my number one rule with being outside is to make sure you are ready to face the climate and can walk for miles.